Small tree with a compact, dense, conical head and ascending branches. Fairly smooth grey bark. 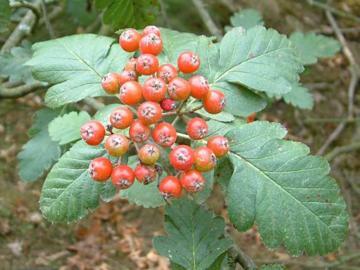 Deeply lobed, toothed, dull dark green leaves, greyish tomentose underneath, often with separate leaflets at the base. Corymbs of white flowers in spring, followed by red berries. Good tree for town parks and street planting. Hybrid of Sorbus aria x Sorbus aucuparia, sometimes occuring in the wild..